Restaurant at The Blue Boar01621 855888work RestaurantLook beyond the Grand Georgian frontage of the Blue Boar Inn, both literally and historically and you will find buildings of rich architectural and social interest as well as sophisticated blend of charm and character reminiscent of a bygone era. The measured symmetry of the Regency frontage which looms over Silver Street conceals an array of ecliptic buildings that have grown over a 650 year period. The oldest part of the complex is the timber framed range immediately to the left as you pass through the coaching archway from Silver Street, this dates back to the second half of the 14th century. 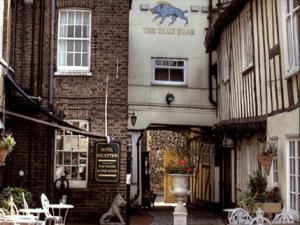 In the 1750’s the Blue Boar was a stopping off point for the Maldon Stage ‘fly’ a coach which ran between Southminster and Aldgate, London and by the turn of the century was one of the principal coaching inns in the town. Look beyond the Grand Georgian frontage of the Blue Boar Inn, both literally and historically and you will find buildings of rich architectural and social interest as well as sophisticated blend of charm and character reminiscent of a bygone era. From A414. Situated next to Maldon church in town centre.